MOSCOW -- The global chemical weapons watchdog agency has said it will meet Wednesday to discuss Britain's U.S.-backed allegation that Russia is responsible for the poisoning of a former double agent in England. Russia requested the meeting and has demanded an "unbiased investigation" by the Organization for the Prohibition of Chemical Weapons (OPCW). In a statement released Tuesday, the OPCW confirmed that its Executive Council had received the request from the Russian representative to the group and that, "the confidential meeting will start at 10.00 am (0400 Eastern) at the OPCW's headquarters in The Hague." The announcement came a day after Russia's foreign minister accused Britain and the United States of spreading "lies and disinformation" about the poisoning of ex-spy Sergei Skripal and his daughter in the English city of Salisbury on March 4. Skripal remains hospitalized in critical condition, but his daughter Yulia has improved and is said to be speaking, though she remains hospitalized. Russian Foreign Minister Sergey Lavrov said Monday that that East-West tensions were worse now than during the Cold War. Britain and two dozen of its allies have expelled over 150 Russian diplomats. The Trump administration expelled 60 Russians from the U.S. alone. Moscow, which vehemently denies any involvement, has responded in kind, expelling dozens of Western diplomats. Russian Foreign Minister Sergey Lavrov denounced the British accusations on Monday as a "mad and horrible provocation." He argued that Russia had no motive to attack Skripal, who was released in 2010 spy swap from a Russian prison where he was serving time for spying for Britain. "If there were any gripes against the man, he wouldn't have been swapped," Lavrov said. Russia's top diplomat also mocked Britain's claim that there was no plausible alternative explanation for the poisonings of the Skripals. British intelligence agencies could have been involved and the case helped distract public attention from the British government's difficult talks to exit the European Union, Lavrov said. "There are other explanations besides those put forward by our Western colleagues, who declare that it can only be the Russians who are responsible," Lavrov said. "It could also be advantageous to the British government, who clearly find themselves in a difficult situation having failed to fulfill their promises to voters over Brexit." On Tuesday, a senior Russian diplomat offered another explanation. Deputy Foreign Minister Alexander Grushko called Skripal's poisoning a "provocation arranged by Britain" in order to justify high military spending, because "they need a major enemy." British officials have previously rejected similar Russian allegations. Lavrov said Monday that Russia had requested the OPCW meeting to discuss the case and asked it to provide details of its cooperation with Britain in the poisoning probe. Alexander Shulgin, the Russian representative at the OPCW, said Monday in televised remarks that the organization must conduct an "open, thorough and unbiased investigation" -- with Russian experts' participation. 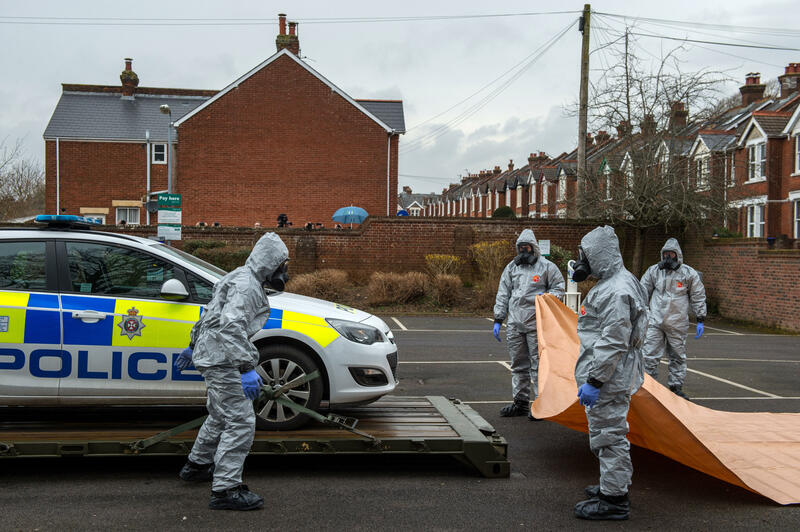 British authorities invited OPCW experts to take chemical samples from Salisbury, the English city where the father and daughter were sickened, and to analyze them. Shulgin warned that Moscow won't accept the agency's conclusions unless Russian experts are allowed to take part in the process. Lavrov also assailed the British authorities for stonewalling Russia's request for consular access to Yulia Skripal, 33, a Russian citizen whose condition has improved since she and her father fell critically ill on March 4. "Many say that the situation now is worse than it was during the Cold War because some rules existed and decorum was observed back then," he said. "Now, Britain, the U.S. and a few countries blindly following them have dropped all decorum and engaged in blatant lies and disinformation."